When it comes to safety behind the wheel, we can’t limit our driving tips to a numbered list. We previously outlined suggestions and must-dos for truck drivers. Here are even more driving tips for professionals at the controls so everyone gets home safely at the end of the day. 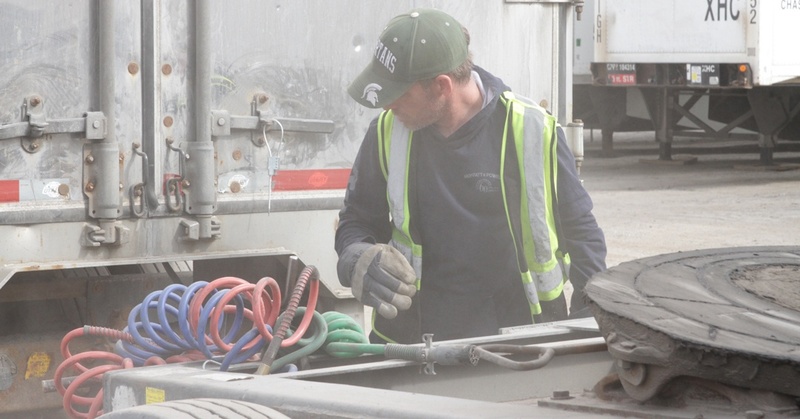 Reduce risks on any departure: Complete your pre-trip inspection each day before driving. After any other stop, before driving again, walk around your entire vehicle to look for any mechanical or safety defects that might have developed since. Before entering the vehicle, check surroundings on all sides for any obstacles or dangers you need to be aware of before departing. Reduce hookup accidents: Stop before backing under any trailer. Get out and check/adjust the trailer height to ensure the kingpin lines up with your fifth wheel. Once coupled, get out, and with a flashlight, ensure the jaws are closed around the kingpin. Hookup your lines correctly and complete a double tug-test before proceeding. Reduce fatigue-related collisions: Before departure from any stop, assess yourself and your state of mind. Based on how you feel, plan the time and location of your next rest stop and then stick to your plan. If you recognize any signs of fatigue while already driving, force yourself to stop and get rest immediately at the next safe location. Be a safer driver by using your imagination: Pretend that the people in other vehicles around you are actually your closest and dearest family and friends. Your choices could affect them negatively, so drive accordingly. Reduce lane-change accidents: Keep to the right whenever possible. Make sure you are fully aware of the vehicles around you, including in your blind spots and change into another lane only if necessary. Signal, make sure you have enough room, check for other vehicles, and then change lanes slowly and deliberately if safe to do so. Your risk of collision is more than doubled when you are in a lane with traffic on both sides of you. Reduce the risk of passing: Pass another vehicle only if it is truly necessary, legal and safe. Your slow-moving vehicle, blind spots and the unpredictability of other drivers all contribute to making passing a risky driving activity that should be avoided whenever possible. Eliminate turning collisions: At all times, be aware of the position of your trailer axles on your trailer. Knowing this will help you to judge the space you need to make a turn. When turning a corner, choose a speed slow enough that you can stop before colliding with anything. Watch your trailer in your mirrors, be ready to stop and keep your trailer wheels close to the curb without hitting or going over. Eliminate low bridge collisions: When approaching, slow down and be ready to stop. If clearance is in doubt, stop beforehand and get out to assess. Inch forward and assess again as often as necessary. Remember that the tail end of your trailer is often the highest point of your vehicle. If you barely make it under, keep in mind that if you return after unloading a delivery, your trailer will ride higher. If you cannot make it under, contact the local police for help. Travel at a safe speed in poor visibility: Apply low beams, fog lights and hazard flashers. Choose your speed based on the rule that you must be able to stop in half the distance you can see. If you are in danger of being rear-ended, find the first safe place to get off the road and wait for conditions to improve. Eliminate personal road rage and reduce stress: Don’t take other people’s driving decisions personally. If another driver does something that aggravates you, force yourself to ignore it. Stay away or let the other driver proceed and continue with your day. If you feel overly stressed, stop in a safe location and take a break.